(Reuters) - Tesla Inc shares fell nearly 4 percent on Monday as a $113 cut in JPMorgan Chase's price target for the electric carmaker added to growing doubts among market players about a plan to take the company private. 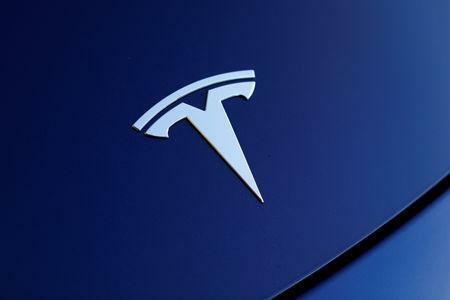 Slashing its price target for Tesla Inc from $308 to $195, the brokerage said it did not believe Chief Executive Officer Elon Musk had funds for a plan announced by a tweet that said "funding secured" two weeks ago. Analysts from the U.S. bank had upped its forecast from $198 to $308 after a roughly $100 surge in Tesla stock following Musk's tweets on Aug. 7 and the note on Monday was the latest evidence of scepticism about the deal on Wall Street. People familiar with the matter said on Sunday that PIF, the Saudi Arabian sovereign wealth fund that Musk says had been pressing to help fund the buyout, is in talks to invest in aspiring Tesla rival Lucid Motors Inc.
"Our interpretation of subsequent events leads us to believe that funding was not secured for a going private transaction, nor was there any formal proposal," JPMorgan analyst Ryan Brinkman wrote in a client note. JPM now targets the stock, which it continues to value at underweight, back at $195, versus Friday's close of $305.50. The median price target of the Wall Street analysts covering Tesla is $336. Tesla shares touched a three-month low of $285 in premarket trading before recovering to trade around $290, reducing its market value back below that of General Motors as the biggest U.S. carmaker. An interview with the New York Times, in which Musk said he was under major emotional stress in the "most difficult year" of his life, on Friday added to investors' concerns over his leadership after a series of social media spats. A person with direct knowledge of the matter told Reuters last week that the SEC has opened an inquiry related to Musk's tweets on the buyout and the billionaire is also facing a class action suite from investors who lost money in the share moves. "The lack of process to (Musk's) announcement has now caused governance and competency concerns which are starting to snowball," said Tigress Financial Partners analyst Ivan Feinseth.